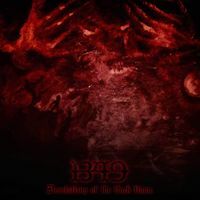 Through their 5th album, Revelations of the black Flame, 1349 take you on a blackened journey that encompasses black metal, dark ambient, noise, industrial and the soundtrack to a twisted movie, maybe the movie of your worse nightmares. My favourite album by them so far. Without giving up extreme, dissonant, high-speed solos completely, 1349 concentrates on midtempoed compos; the long intro and the instrumental passages have an organic nature, none is cut too early, giving time for the atmosphere to settle down. In the past, 1349 was a band I enjoyed to see more than to listen to. The music had to be accompanied by visual effects. Now, the visual effects occur in your mind while listening to the music. 1349 seems to have thought about the fact that to truly capture the aural essence of evil, you need to contrast and time for the musical soundscape to lull you in a sense of false security. This album was produced by the legendary Tom G. Warrior of Celtic Frost and you may choose between three formats: the standard CD, the special edition double CD that includes a bonus live disc recorded in Stockholm, and the deluxe 180 gram blood red collector's vinyl. OR you may get yourself all three.